If you are looking for a summer drink recipe with Indian flavours, this spiced guava chilli drink will fit the bill perfectly. It is a guava drink with some fieriness from green chilli, red chilli powder and black pepper; it is also spruced up roasted cumin powder, pink salt, lemon juice and mint leaves. A perfect combination of flavours comes together in this glass of guava chilli drink. Guavas are among my favourite Indian fruits. But, my love for it comes with some clauses. I don’t particularly love the ripe guavas – I love the ones that are a little tart (not hard) but sweet. They are juicy and flavourful. The kind of guavas I like are generally sold by street vendors who sit with a ‘tokri’ full of them. When requested they will slice it in front of you, apply some salt and red chilli powder and you are good to devour the ‘chatpata’ guava slices. I can happily devour a couple of guavas like that without complaining. I often buy a small pack of guava chilli drink by the brand paperboatdrinks. I am not a fan of bottled juices, but this one is something I can’t resist. 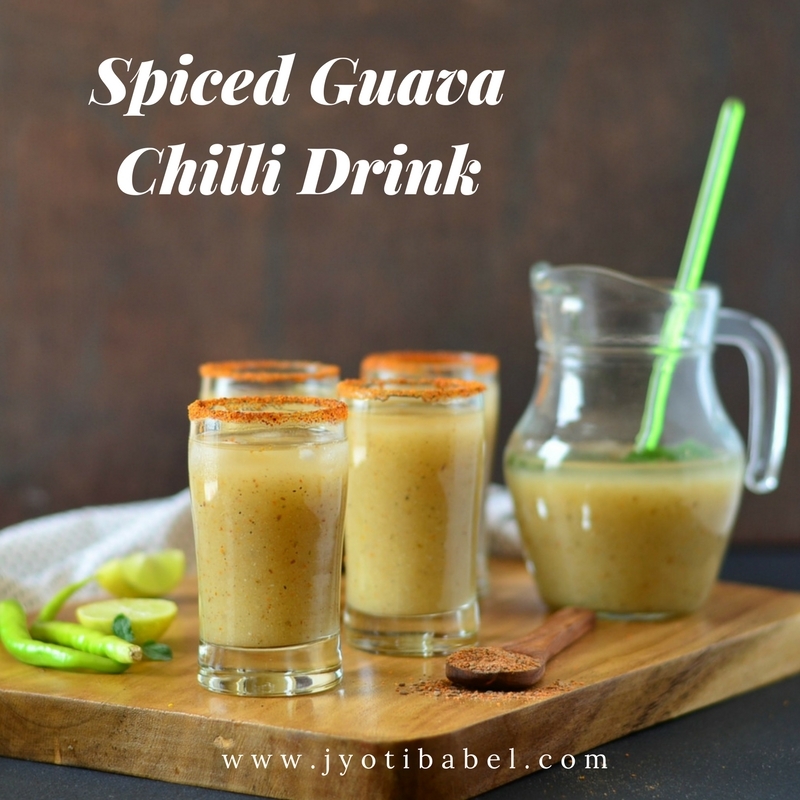 So, when I had some ripe guavas at hand I made this drink – spiced guava chilli drink – and I loved the way it turned out. My neighbour also vouched for its taste. So, I was sure, this is worthy to be blogged about. If you do try this recipe, keep in mind that depending on the sweetness of the guava you might have to adjust the spices and sugar. Keep the measures in the recipe as a standard and play around with the quantity if needed, to suit your taste buds. I didn’t want this drink to be very spicy, so I just used chilli water. If you want it spicier, churn a chilli or two with the guavas. I have used sugar here, but you can use jaggery also. 1. Boil a cup of water in a pan. Chop the guava into small chunks and add them to the pan of boiling water. Cook for 5 to 7 minutes till the chunks are cooked and are soft. Set it aside to cool. 2. Once cooled blend it in a blender and sieve it to get a smooth guava puree. 3. While the guava is cooling add the sugar in 1/4 cup of water and boil for 3-4 minutes to form a thin sugar syrup. Set aside to cool. 4. Add the slit chilli into 1/4 cup boiling water and simmer for 3-4 minutes. Set aside for the chilli flavour to seep into the water. 5. In a tall jug add the guava puree, sugar syrup, chilli water and rest of the listed ingredients. Stir. Add ice cubes and the chilled water and stir again. Taste and adjust the sugar and spices if needed. 6. Dip the edge of the glasses in lemon juice and then line it with red chilli by dipping them in a bowl of red chilli powder. Pour the chilled spiced guava drink into the glasses and serve it immediately. 1. If you want to make it spicier, churn one or two green chilli along with the guava. 2. Instead of sugar, you can use powdered jaggery. 3. Adjust spices and sweetness as per your taste. Looks good.. will try it out this summer. An unique and super yummy drink. Loved it. Bookmarking it to try later. Lovely click. Super refreshing yummy drink with my favourite fruit...I miss guava here...Awesome share!! Lovely chatpata drink! Love all the flavors that have gone into this refreshing mocktail. This must be lip smacking good with a big punch of flavour from the spices. How lovely to use lemon and red chilli powder for the glass rims! Jyoti, such stunning images my dear! Captivating! 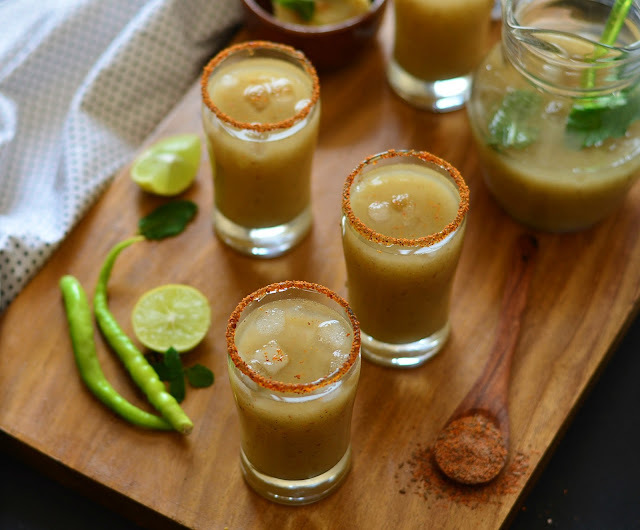 Coming back to the drink - I am a big fan of anything spicy with the sweet fruits and make this often at home when guavas are in season. Refreshing with the chilli punch - an excellent drink to serve at parties than the usual mocktails. Congrats on being the top post on Indiblogger Jyoti! This drink is just right for the season and just what I enjoy. Definitely something to try on. I had tasted chilli guava and quite like it. Lovely share and presentation. Omg I am drooling jyoti, seriously I miss eating guavas and here you are shoeing this tempting drink. Looks just amazing. Spiced Guava chilli drink sounds interesting. Would love to try it soon.